I’ve been publishing videos on my English Harmony YouTube channel for a good few years now, and there was a time when I thought I was pretty much the only foreign English speaker publishing videos on YouTube. Sure enough, I’d seen some videos made by beginner and lower-intermediate English learners in a bid to exercise their spoken English skills, and it’s all nice and well, but what I’m talking about when saying I thought I was the only foreigner publishing videos is a well-established YouTube channel with massive following! Needless to say, I proved wrong. Well, you see – probably the biggest obstacle in finding such YouTube channels was the fact that initially I was looking only in the English learning and teaching niche. And I’ve got to tell you that in this niche I’m indeed pretty much the only foreigner. Once I started looking beyond English learning and improving though, I started finding well-established YouTube channels where other foreign English speakers were sharing their thoughts and expertise on various other things. And it only goes to show that pretty much the only way to achieve complete English fluency is by enjoying life and things you LOVE instead of focusing on English learning related materials! 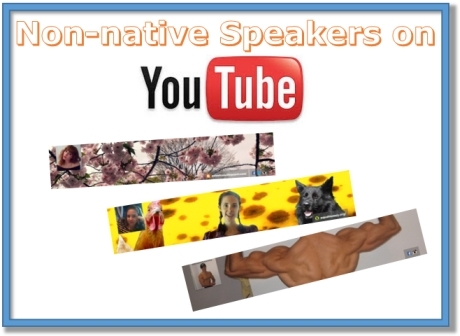 So, without further ado, let me introduce you to these YouTube channels run by foreign English speakers, and I’m 100% sure you’ll find at least one of them extremely captivating and relevant to your own interests as well as providing an extra motivation to keep improving your spoken English to a level where you could possibly start recording similar videos and who knows… maybe you’ll even start a YouTube channel of your own one day! Luimarco is originally a French guy but he’s been living in Canada for a long time, and as you may know Canada is a bilingual country in a lot of places – Quebec being the most known region. So, this Canadian dude is a natural bodybuilder and he started his YouTube channel as a way of promoting steroid-free bodybuilding tips and share his experiences in the field, but soon enough he expanded into other aspects of life and eventually he started his life-coaching channel Ask Luimarco. And here’s the thing my friends – even if you’re not into fitness at all, you’ll definitely find Luimarco’s videos really, really engaging for the simple reason that he injects so much humor in his videos that sometimes I find it hard to restrain myself from laughing! Another reason to follow Luimarco’s YouTube channels is the massive value of exposure to his English language. He’s using AN AWFUL LOT OF various English idiomatic expressions and phrases, and he’s a brilliant example of how ANY foreign English speaker can achieve English fluency by injecting their speech with a lot of phrases. Personally I’ve picked up quite a few expressions from him, so you may definitely want to do the same thing! Coincidentally, this YouTube channel is run by another French-speaking person, and this time around it’s a girl named Emy. I like her YouTube channel for the following reasons – her accent is REALLY cute (another proof that speaking English with foreign accent is no big deal) and she’s making videos about a large variety of topics which makes a really interesting listening experience! Emy’s widely travelled, she speaks Japanese (some of her videos, such as this one, is made purely in Japanese! ), and most importantly – she’s a very intelligent person having opinion on a lot of things. As I previously said in this article – it’s not about learning and speaking the English language so much as it’s about ENJOYING life through English, and getting to know other people’s opinions about various things using English as a medium is definitely one of the best ways to experience life. On top of that, when foreign English speakers speak, they use easy-to-understand language and they speak slower than your average native English speaker, so even if your English comprehension mightn’t be the best, you’ll still understand what Emy’s talking about in her videos. I’m not really sure as to why this Belgian girl called her YouTube channel persona Spam Ann, but one thing is for sure – her videos are nothing like spam! They’re very informative, and she really struck a chord with me by discussing global issues in her videos and on her blog that I came across when checking out her YouTube profile. She talks about such shocking things as mysterious disease turning children into zombies in Africa and Korean factory workers being forced to wear diapers, so basically her main focus is the inequality of wealth, gender and race on our planet, and in so many ways she reminds me of Luimarco because he also touches upon similar subjects on his life-coaching channel. If you follow Ann’s channel you’ll definitely widen your horizons and you’ll learn how to express yourself in relation to various life aspects which will come in really handy when having discussions with other English speakers in real life. And, as I already said, the fact that a foreign English speaker speaks more clearly and not as fast as a native English speaker is an added bonus, so you can rest assured you’ll understand everything Ann’s going to say in her videos! Now, these are YouTube channels run by foreign English speakers that I follow myself. Maybe you know other YouTubers from a non-native English speaking background cranking out daily videos that all our fellow foreigners should follow? Are you sure Generikb is a Bulgarian? He sounds American to me! I don’t know if this is going on, but I know some. Of course, they’re all lets players. Is he? If that’s the case, his American pronunciation is impeccable! Sorry Tomoki, but pewdiepie isn’t a foreign English speaker so he doesn’t qualify! Channels I mentioned on this blog post are all run by foreign English speakers! I strongly believe it’s best to listen to real-life English which isn’t purposefully created in order to LEARN English. Sure enough, listening ESL videos won’t hurt and will be helpful on many occasions; having said that I’ve always enjoyed real life English more than artificially created content. How about ESL related vídeos? Would you recommend any of them or do you think they are not useful whatsoever?